Is Your Aging Parent at Increased Risk of Developing High Blood Pressure? - All Care Hawaii. LLC. Is Your Aging Parent at Increased Risk of Developing High Blood Pressure? Elderly Care in Kailua HI: Is your Aging Parent at Increased Risk of Developing High Blood Pressure? High blood pressure is one of the most common health issues throughout the United States with more than 75 million people suffering from it. This number accounts for approximately 32 percent of the total adult population, or more than 1 out of every 3 adults in the United States. As a family caregiver it is important that you understand this frequency as well as the individual risks that your aging parent faces so that you can either give your parent the care that they need to reduce that risk or to properly manage their condition if it does develop in their later years. It is important to note that just because your parent has risk factors does not mean that they are necessarily going to develop high blood pressure, and even if they have only one or no particular risk factors, they might still develop it. This makes it extremely important to keep track of your parent’s health and make sure that they are living a healthy lifestyle with proactive medical care so that they can detect this condition as early as possible and get them on the course of treatment that is right for them. If your aging parent has been diagnosed with high blood pressure, or they are at increased risk of suffering from this condition, now may be the ideal time for you to consider starting elderly care for them. 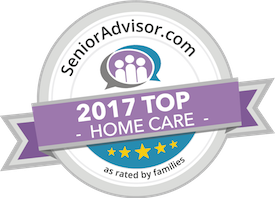 An elderly home care services provider can be with your aging parent on the schedule that is right for them regardless of how much care they need, how often they need it, or how much care you give them regularly. This means that whether your parent’s needs are mild or complex, you can work with the elderly home care services provider to devise a course of care, management, support, and assistance that will help them to stay safe, healthy, comfortable, and happy throughout their later years. Through a highly personalized approach to their care, this care provider can help your loved one live the quality of life that they desire and deserve, remain as independent as possible, and find meaning and fulfillment in this chapter in their life. If your elderly loved one is at increased risk of developing high blood pressure but has not yet been diagnosed with this condition, an elderly care provider can be a valuable source of support for your care efforts to reduce this risk and keep your parent healthier as they age in place. This can include helping your parent understand the risks that they are facing and encouraging them to make meaningful modifications to their lifestyle that will help to keep their blood pressure lower and their body healthier. Have questions about elderly care in Kailua, HI? Contact the caring staff at All Care Hawaii today. Call Oahu (808) 206-8409 or Maui (808) 664-3853. Call us 24 hours a day, 7 days a week!